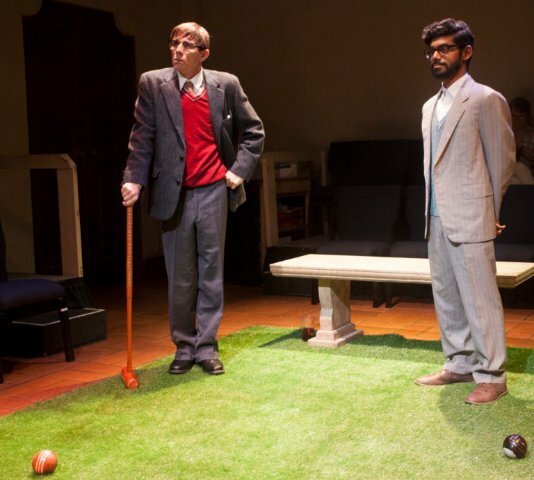 Alan Coyne as Stephen Hawking, Tirumari Jothi as Jayant Narlikar. Photo by John Feld. Stephen Hawking was one of the most influential scientists of recent times. Fortuitously, while a graduate student, he chose the less traveled of the two roads in theoretical physics, cosmology. Not only did Einstein’s robust and far reaching Theory of General Relativity provide a great springboard for further research about the grand questions of the universe, like its creation and the nature of time. The questions are of such significance as to tantalize the curiosity of the multitudes because of their existential and religious implications. Not so the dominant branch of the field, particle physics, that focuses on the micro side – atoms, the building blocks of the universe. Hawking was also fortunate that he chose a conceptual rather than experimental field, as his contracting amyotrophic lateral sclerosis (Lou Gehrig’s Disease) resulted in incapacities that left him ultimately with minimal physical functionality. Yet, with a life expectation of two years after diagnosis, he survived over half a century as an eminent scientist. Writer and director Bruce Coughran honors this outsized intellect with his world premiere play A Time for Hawking. But rather than exposing a broad swath of Hawking’s life, as does the 2014 movie The Theory of Everything, the playwright has cleverly designed an entertaining real-time 100 minute drama which takes place in the garden at a private party in Hawking’s home town on New Year’s Eve 1962. Although the storyline, such as it is, is plausible fiction, the referenced events and characterizations of the dramatis personae draw from their real lives. On the night in question, Stephen and his fellow graduate student colleague, Jayant Narlikar, exchange small talk, when they are joined by Jane Wilde, who had known the Hawking sisters growing up. While the conversations drive forward the relationships of the three, more importantly, they are used to expound upon a number of the most important theories and theorists of physics. Surprisingly, their talk also touches on the topics of Indian religion and philosophy and Spanish poetry, as well as the concepts of learning, reconciliation of contradiction, and truth. Alan Coyne’s portrayal of Stephen Hawking is riveting and powerful – a wonderful fit of actor to role. Starting with a fine physical approximation, Coyne finds the often ungainly movement and the uneasy affect of a young man with towering intelligence yet self-effacing humility and clumsy socialization. His effortless exposition of physics theory contrasts with his more stammering effort to reach Jane personally. As intense and insistent as Coyne is as Stephen, Tirumari Jothi as Jayant is unassuming and unflappable, with a positive outlook and perpetual smile. Like Jayant, Jothi is an ethnic Indian, and he conveys the character’s easy flow of life, where karma is accepted and reality and imagination merge rather than diverge. This is Jothi’s first theatrical performance, and he comports himself well, if a little unevenly. Oddly, the weaker moments derive in part because his vocal projection and understandability with his Indian accent (learned for this part!) varies. But Stephen’s alluring nemesis is Jane, played with stunning authority by a wonderful Adrian Deane. Proper and imperious, she is the immovable object that challenges Stephen’s beliefs. As a Spanish literature student, intellectually strong and undaunted by the scientists, she represents the perspective of the humanities. She asserts her own world view with confidence and questions what Stephen and Jayant accept as the truth and beauty of cosmology. In all, A Time for Hawking is a brisk-moving, well-explicated educational primer in the form of an involving comedy/drama. The playwright, who also directs, has selected three contrasting characters whose real lives would intersect in significant ways. He has deftly integrated a panoply of scientific and philosophical milestones into their conversation. One criticism is that there is much to absorb for the non-scientific person, and visual images, possibly in the form of projections, would help the understanding. Also, the pacing is a little troublesome at times as pregnant pauses become a little too pregnant. But these are small concerns in a notable accomplishment. As a footnote, the company, Indra’s Net, occupies a special niche in the Bay Area as a producer of plays with scientific content that always entertain. They perform already existing plays and new works like this one and previously The Secret of Life, the award winning play about the breakthrough discovery of DNA’s double helix. Both were written and directed by founder and artistic director Bruce Coughran. Their venue suits the intimacy of conversation plays. A Time for Hawking by Bruce Coughran is produced by Indra’s Net Theater and plays as Berkeley City Club, 2315 Durant St., Berkeley, CA through January 13, 2019. "Hi Vic. Nice job with this "Hawking-based" review. I guess it takes a former international banker who writes theatre reviews to break-it-all-down for us liberal arts types. Best to you and Karin. Is a future Sherman's visit on your 2019 Calendar?"